TORONTO , May 15, 2018 /CNW/ - First Cobalt Corp. (TSX-V: FCC; ASX: FCC; OTCQX: FTSSF) (the "Company") is pleased to announce it has expanded its review of muckpile material to include third party muckpile material from the Canadian Cobalt Camp. This expanded review is intended to assess processing opportunities using the First Cobalt mill and refinery complex. First Cobalt and Cobalt Power Group Inc. (TSX-V: CPO; OTC Pink: CBBWF) will collaborate on a review of historic waste rock on Cobalt Power's land package to identify its suitability as potential feedstock. "We are pleased to share our knowledge with Cobalt Power as they undertake a sampling program of historic waste rock from past mining operations. The First Cobalt Refinery is the only permitted cobalt refinery in North American capable of producing battery materials and we welcome the opportunity to work together with our neighbours in the Camp towards the objective of accelerating our timeline to potential production." First Cobalt announced an extensive sampling program in 2017 at a number of historic mining operations in the Cobalt Camp (see press release November 15, 2017 ). The program is intended to provide insights into the distribution of cobalt, silver, nickel and copper from underground waste material brought to surface at historic mining operations. The Company has agreed to share the preliminary results and methodology employed with Cobalt Power to assist with a sampling program of muckpile material located on their properties. The intent is to identify potential feed for processing using the mill equipment and the First Cobalt Refinery. 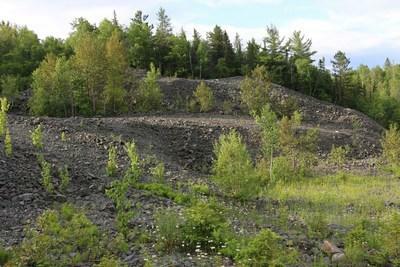 Muckpiles are mine rocks that have been broken by blasting during mining operations (Image 1). The majority of historic mines in the Cobalt Camp were narrow underground operations and muck not considered high grade silver ore was generally left on surface as uneconomic waste rock. First Cobalt has reported numerous high grade cobalt and other base metal assays from selective sampling programs near past mining operations, including grades of up to 3.9% cobalt, up to 1.63% zinc, and up to 4,990 g/t silver from the Juno and Drummond mines (see press releases October 26, 2017 and December 4, 2017 ) and high grade cobalt values in fracture and disseminated material, including grades of up to 3.76% cobalt from near Bellellen mine (see press release September 28, 2017 ). The First Cobalt Refinery is the only permitted cobalt refinery in North America designed to produce battery materials. The facility is a hydrometallurgical cobalt-silver-nickel refinery located approximately five kilometres east of Cobalt, Ontario . The facility is located on a 40-acre property that can be expanded to 120 acres. The facility is fully permitted for processing feed containing elevated concentrations of arsenic, such as those from the Canadian Cobalt Camp, the Idaho Cobalt Belt and elsewhere in North America . The flowsheet and timeline for a potential restart of the Refinery are the focus of a recently announced study, following the announcement of a friendly merger with US Cobalt Inc. (TSX-V: USCO, OTCQB: USCFF) (see press releases April 19, 2018 and March 14, 2018 ). US Cobalt's primary asset is the Iron Creek cobalt project in Idaho , which has a historic mineral resource estimate (non-compliant with NI 43-101) of 1.3 million tons grading 0.59% cobalt and 0.3% copper. A 10,700 metre drill program was recently completed at Iron Creek to confirm this historic estimate and a current mineral resource estimate is expected during 2018. US Cobalt's securityholders will vote on the proposed transaction on May 17, 2018 . Peter Campbell , P.Eng., is the Qualified Person as defined by National Instrument 43-101 who has reviewed and approved the contents of this news release. Mr. Campbell is also a Competent Person (as defined in the JORC Code, 2012 edition) who is a practicing member of the Professional Engineers of Ontario (being a 'Recognised Professional Organisation' for the purposes of the ASX Listing Rules). Mr. Campbell is employed on a full-time basis as Vice President, Business Development for First Cobalt. He has sufficient experience that is relevant to the activity being undertaken to qualify as a Competent Person as defined in the JORC Code. First Cobalt aims to create the largest pure-play cobalt exploration and development company in the world. The Company controls over 10,000 hectares of prospective land covering over 50 historic mines as well as mineral processing facilities in the Cobalt Camp in Ontario, Canada . The First Cobalt Refinery is the only permitted facility in North America capable of producing cobalt battery materials. First Cobalt seeks to build shareholder value through new discovery, mineral processing and growth opportunities, with a focus on North America . This news release may contain forward-looking statements and forward-looking information (together, "forward-looking statements") within the meaning of applicable securities laws and the United States Private Securities Litigation Reform Act of 1995. All statements, other than statements of historical facts, are forward-looking statements. Generally, forward-looking statements can be identified by the use of terminology such as "plans", "expects', "estimates", "intends", "anticipates", "believes" or variations of such words, or statements that certain actions, events or results "may", "could", "would", "might", "occur" or "be achieved". Forward-looking statements involve risks, uncertainties and other factors that could cause actual results, performance and opportunities to differ materially from those implied by such forward-looking statements. In particular, forward-looking information included in this news release includes, without limitation, the anticipated closing date of the Transaction, the receipt of final court approval and other regulatory approvals. Factors that could cause actual results to differ materially from these forward-looking statements are set forth in the management discussion and analysis and other disclosures of risk factors for each of First Cobalt and US Cobalt, filed on SEDAR at www.sedar.com. Although First Cobalt and US Cobalt believe that the information and assumptions used in preparing the forward-looking statements are reasonable, undue reliance should not be placed on these statements, which only apply as of the date of this news release, and no assurance can be given that such events will occur in the disclosed times frames or at all. Except where required by applicable law, First Cobalt and US Cobalt disclaim any intention or obligation to update or revise any forward-looking statement, whether as a result of new information, future events or otherwise. US Cobalt considers the cobalt and copper tonnage and grade estimates above as historical estimates. The historical estimates do not use categories that conform to current CIM Definition Standards on Mineral Resources and Mineral Reserves as outlined in National Instrument 43-101, Standards of Disclosure for Mineral Projects ("NI 43-101") and have not been redefined to conform to current CIM Definition Standards. They were prepared in the 1980s prior to the adoption and implementation of NI 43-101. A qualified person has not done sufficient work to classify the historical estimates as current mineral resources and US Cobalt is not treating the historical estimates as current mineral resources. More work, including, but not limited to, drilling, will be required to conform the estimates to current CIM Definition Standards. Investors are cautioned that the historical estimates do not mean or imply that economic deposits exist on the Iron Creek property. US Cobalt has not undertaken any independent investigation of the historical estimates nor has it independently analyzed the results of the previous exploration work in order to verify the accuracy of the information. US Cobalt believes that the historical estimates are relevant to continuing exploration on the Iron Creek property.